Viola is a genus in the Violaceae family and made up of annuals, perennials and subshrubs (very small shrubs) found in temperate climates around the world. The common name, viola, is also its genus name. Annual violas are common landscape plants with 1- to 1½-inch diameter flowers, whereas pansies (another type of viola) have flowers of 2 or more inches in diameter. Most violas are small, and clump-forming, with lobed, kidney-shaped, or heart-shaped green leaves. All violas have five-petaled flowers, with the lower petal showing dark markings. White, yellow and purple are dominant viola flower colors, but other colors exist as well and are found among those called pansies or violets. Viola plants range in size, from 2 inches up to about 1 foot in height and with 4 to 15 in spread, depending on the species and cultivar. Violas are hardy plants that easily grow in sun or in shade. Most do well in moist, but well-drained, garden soil. Woodland species prefer richer organic soil. Violas are frost tolerant and are generally hardy in USDA zones 4 through 10, depending on which type is grown. The blooming season varies by species, with many flowering in spring and summer. 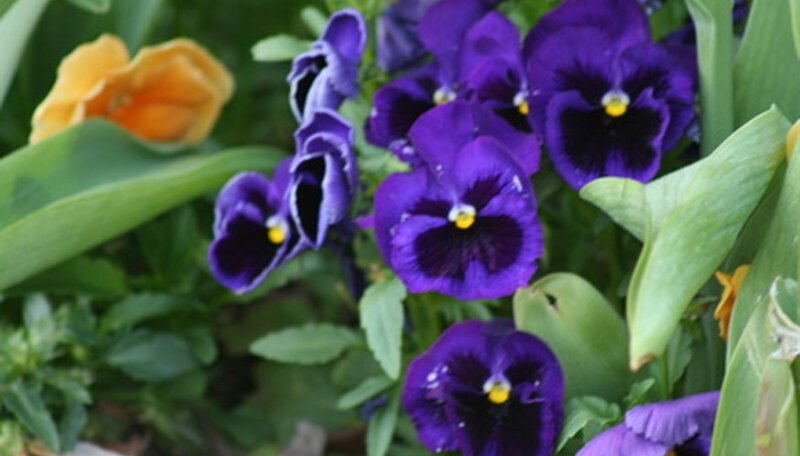 Plant clump-forming violas 6 to 8 inches apart, and trailing or spreading types 10 to 12 inches apart. Mix a slow-release fertilizer into the garden soil and provide water when the soil is dry. Propagate violas by division, or from seed or by cuttings. Versatile violas are useful in northern gardens all summer long, in either sun or shade. In the south, grow violas in shady locations during the hottest part of the year. In winter (especially in mild climates), frost-tolerant violas provide abundant color in massed beds, hanging baskets and other containers. In addition to landscape use, viola flowers are edible, with culinary uses such as in jams, jellies, teas, garnishes and salads, according to University of Vermont extension literature. Viola cultivar, Starry Night (V. cornuta), is a perennial capable of blooming from spring to autumn. It grows in a compact mound, reaching 6 to 10 inches tall and 8 to 10 inches wide, and produces primrose blooms with lavender edges. Viola tricolor cultivar, Bowles' Black, is rich and velvety-looking with its dark-petaled flowers and yellow-eyed centers. Viola tricolor blooms from spring to early autumn. Other species include, Viola adunca, Viola obliqua, Viola odorata, and Viola sororia. Violas are relatively disease and pest free when grown in favorable conditions. Proper plant spacing, good air movement, soil drainage and avoidance of standing moisture on leaves (early irrigation) contribute to overall healthy garden violas.